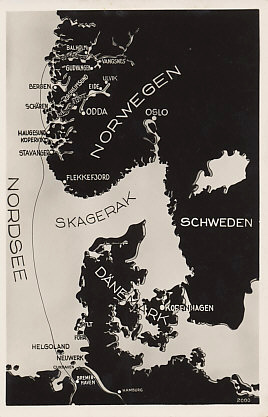 Map of the Skaggerak, between Denmark's Jutland Peninsula, and southern Sweden and Norway, routes between Bremerhaven, Germany and the Hardanger and Sogne Fjords of Norway. A German island in the North Sea with a town and port. Off the German coast and guarding the approach to its coastal islands and the mainland, the island had been a British possession since 1814. In the Anglo-German Agreement of 1890 - the Heligoland–Zanzibar Treaty - it was part of an exchange that included land in Africa. In the treaty, Germany received Helgoland, the Caprivi strip connecting German Southwest Africa to the Zambezi River, and land around Dar es Salaam which became the basis for German East Africa. In return, Britain received territory held by Germany in east Africa. On August 28, 1914, a British fleet under Tyrwhitt and Roger Keyes led a raid on the German naval base at Helgoland with 2 light cruisers, 25 destroyers and 3 submarines. German naval forces were aware of the plan, and the British were rescued by the arrival of three battle cruisers under David Beatty. With Beatty's arrival, the British sank three German light cruisers, Köln, Mainz, and Ariadne, heavily damaged three others, and sank a destroyer. The British light cruiser Arethusa was badly damaged but towed home. Helgoland is an island in Germany.